Offshore oil driller Transocean Ltd said on Tuesday it would buy peer Ocean Rig UDW Inc in a $2.7 billion cash-and-stock deal, its second major acquisition this year as the company bets on a recovery in the offshore sector. Global crude prices have since recovered to above $70, renewing producer interest in offshore basins around the world, including Brazil and the U.S. and Mexican Gulf of Mexico. The deal would provide Switzerland-based Transocean with nine ultra-deepwater drillships and two semisubmersibles, the company said. Annual cost savings are projected to be about $70 million. "The combination of constructive and stable oil prices over the last several quarters, streamlined offshore project costs, and undeniable reserve replacement challenges has driven a material increase in offshore contracting activity," said Transocean Chief Executive Jeremy Thigpen. 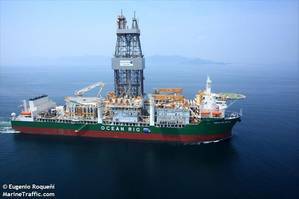 Ocean Rig shares were up 11.7 percent at $30.24, after climbing roughly 13 percent, while Transocean's U.S.-listed shares fell 6.5 percent to $11.33 at mid-morning. Transocean earlier this year acquired Norwegian rig firm Songa Offshore in a $1.1 billion deal. "We see strong contract opportunities emerging across the globe for the combined fleet (particularly in Brazil)," analysts at Tudor Pickering & Holt Co wrote in a note on Tuesday. Majors, including Norway's Equinor, Chevron Corp and BP, won bids for offshore blocks in Brazil, which hold billions of barrels of oil. Elsewhere, Exxon Mobil Corp said last month it had begun offshore exploration drilling off Australia's southeast coast, while also pursuing finds at its offshore Guyana discovery. "The announcement is not a surprise. Industry consolidation is necessary to get these premium assets back to work over the next two to three years," Leslie Cook, an analyst with Wood Mackenzie, said in a note. She added that, "as rates begin to float back up, the need to keep drilling costs down will drive demand for these newer rigs." Transocean will pay 1.6128 newly issued shares and $12.75 in cash for each share of Ocean Rig's common stock for an implied value of $32.28 per Ocean Rig share, which represents a premium of 19.2 percent to the stock's close on Friday. Upon completion, Transocean shareholders will own about 79 percent of the combined company, while Ocean Rig shareholders will hold the remaining 21 percent.